Indeed. 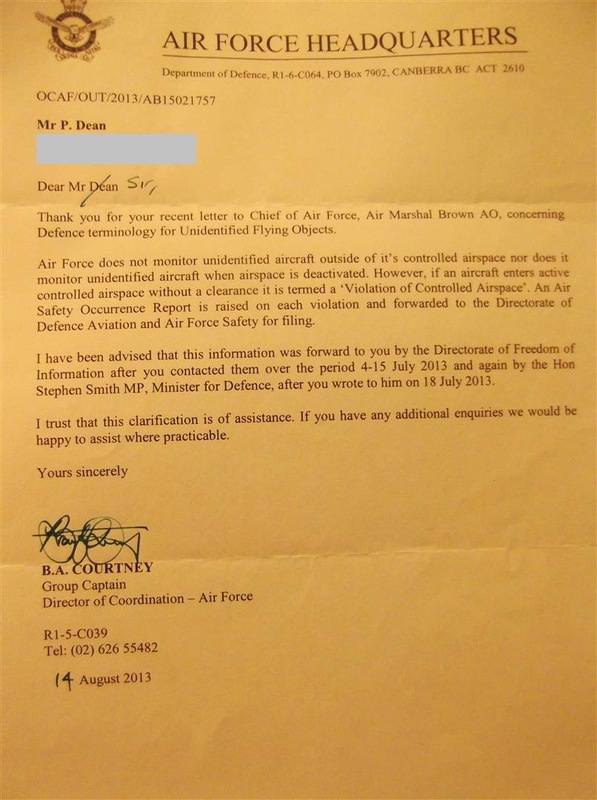 This, and other misleading statements, formed the body of a 14th August, 2013 reply letter from the one Group Captain Barbara Courtney, Director of Coordination, Royal Australian Air Force (RAAF) to my very specific inquiries sent to the Office of the Chief of Air Force on 6th August, 2013, as we shall see. Thus, my detailed enquires are dismissed in three sentences. Firstly, not once in my enquiry letter did I specifically ask about airspace. What I did ask about is all terms, terminology and references for UFO events – be they unknown or unidentified aircraft, aircraft operating illegally, re-entry of space debris bodies, or anything else stranger still; and in all settings – pilot voice transmissions, training manuals for defence aviators, etc. However, one has to go with the reply that was given to me, and the terminology they offered is ‘Violation of Controlled Airspace’. Are we to assume then that an Australian Army helicopter pilot would state to controllers: “What traffic do we have up here with us… I have a violation of controlled airspace flying with me on my port side!” The notion that a pilot would use a phrase such as ‘violation of controlled airspace’ to describe another aircraft is, of course, ludicrous. I have since found out, through dealings with three current members of the Australian Defence Forces (ADF) that a few terms would be used by personal, which include, predictably, ‘unknown’ and ‘unidentified aircraft’. Furthermore, I have since found out that the RAAF’s 41 Wing, one of four Wings that make up the Surveillance and Response Group, use the terms ‘Contact of Interest’ and ‘Critical Contact of Interest’. I have also seen the term ‘Uncooperative Target Infringement’ in an internal DoD email. So much for the Director of Coordination’s efforts to detail this information to me. NOTIFIED BY AIRAC, THE AUSTRALIAN DEFENCE FORCE HAS ESTABLISHED AN AIR DEFENCE IDENTIFICATION ZONE (ADIZ) WI 200NM RAD OF SYDNEY DME, SURFACE TO FL600 (Not RAAF airspace and some not civil controlled airspace) FOR APEC 2007 ECONOMIC LEADERS WEEK (AELW). THE PROCEDURES FOR AIRCRAFT OPERATING WI AN ADIZ ARE DETAILED IN AIP ENR 1.12 - INTERCEPTION OF CIVIL AIRCRAFT…. So, here we see an example of the RAAF monitoring uncontrolled airspace, and it does not take a genius to realise that they would have been doing so to, amongst other things maybe, monitor unknown aircraft or suspiciously behaving aircraft during this time. Thirdly, the reply letter sent to me also states “An Air Safety Occurrence Report is raised…” for airspace violations and is “forwarded to the Directorate of Defence Aviation and Air Force Safety of filing.”. This is essentially correct, it seems, as I have confirmed the issue with two sources for which I am grateful. However, the term “Air Safety Occurrence Report” may be, in fact, actually known as an “Aviation Safety Occurrence Report”. The terms “air” and “aviation” are, of course, interchangeable, so, while me highlighting this matter here may seem pedantic, when one is attempting to gain information for future FOI Requests, every single detail counts. Requesting a document that does not technically exist is obviously not in the best interests of anyone. The above examples of clear misrepresentation of facts by the RAAF is not evidence of a cover-up of any UFO activity which may be occurring in Australia’s airspace. It is, however, an example of fob-off and lethargy in dealing with a serious researcher who is asking very reasonable questions to the very people he pays to employ. Of course, there are the bewildering number of documented examples where outright lies have been dealt out by such agencies regarding the UFO matter; and not involving just civilian researchers. There has been around the globe, as many of you will know, a succession of Prime Ministers, Defence Ministers, Presidents, Chief’s of Air Staff, Commander-in-Chief’s of Unified or Joint Commands, Secretary’s of Defence or Intelligence, etc who have been deliberately misled and lied to by the few that know more about the UFO matter than they care to let on – and that’s putting it mildly. I will be, in future, documenting some such examples which have come directly from government archives. Knowing that such leaders and military top brass have been given the run-around does not bode well for anyone else attempting to obtain some honest answers. After all, if the great Winston Churchill was misled by the British Air Ministry during his Prime Ministership, as can be found in a ten page file at the Public Records Office in Kew, England, what chance does a civilian researcher have?